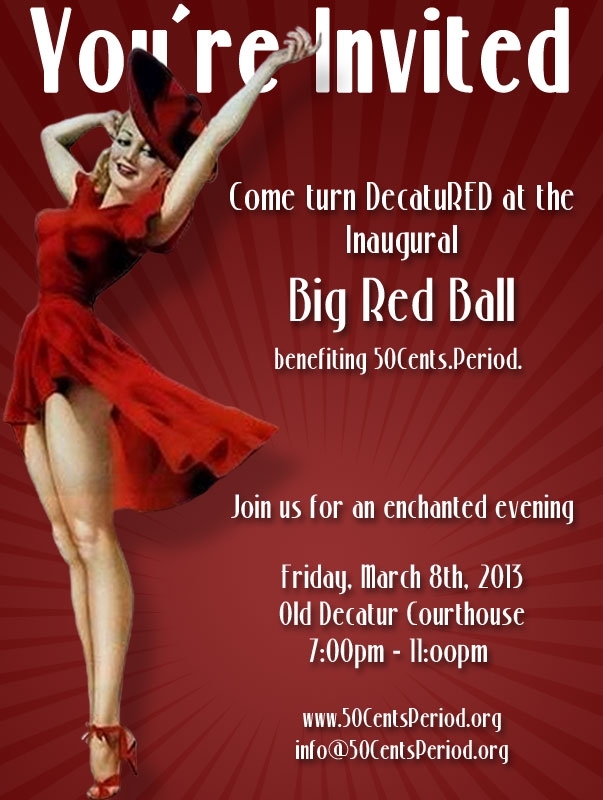 Big Red Ball Fundraiser…a great reason to get all dolled up, Atlanta moms! 50 Cents. Period., founded in 2010 by Atlantan Lorrie King to aid girls in developing countries who miss a week of school each month because of their periods,invites you to its 2013 fundraiser, the Big Red Ball. The inaugural event will take place at the Old Courthouse on the Square in Decatur on Friday, March 8, 2013, from 7 to 11 p.m. Lavish bites from Alison Lueker of Atlanta’s Sun in My Belly will highlight a convivial evening of dinner, drinks and dancing with Stiletto Dance Company and music from Atlanta Big Band at one of Decatur’s most lauded venues. Over 200 guests will convene to enjoy Lueker’s distinct dishes as well as the benefit’s signature cocktail, the Big Red Bev. Guests are encouraged to “paint the night red” as they dance and mingle at one of 2013’s most important charitable events. Sponsored by Team Red in partnership with Sun in My Belly and Stiletto Dance Company, tickets are $115 ($95 before February 18th). 50 Cents. Period. is comprised of Team Red, a growing group of volunteers who believe passionately that women and girls must not have their educations and opportunities curtailed because of their inability to have access to fundamental supplies during their periods. Water and sanitary supplies are things women in the developed world often take for granted, but the international business strategists, public health professionals, writers, health practitioners and educators who make up Team Red know that girls in developing countries may miss a week of school – and life – each month. Just 50 cents buys a month of sanitary supplies and an uninterrupted education. For women with no access to sanitary supplies, 50 cents provides the freedom to simply leave their homes and engage with life. The solution is simple; the impact lasts a lifetime. Team Red’s mission is to raise consciousness and much-needed funds for this important and potentially life-altering issue. 50 Cents. Period. focuses programs and advocacy in underserved, traditionally marginalized communities, addressing issues such as chaupadi – the forced, ritualized exclusion of women during their periods, and providing sanitary products, women’s health education workshops and curriculae, clean water and sanitation facilities. 50 cents can change the future!